21 December 2018 (Toronto, ON) – A traditional Yule log video is fine and all but after a while the incessant crackling, pops and dull roar of the fire can get monotonous and lull you and your guests to sleep, not very ideal for getting the party started. This holiday season, UMe has taken the Yule log to the next level and created several ways for you to Turn Up The Joy and set the perfect ambiance with their multimedia mood creator that combines festive environments with their eclectic Christmas Music playlist filled with beloved holiday hits past and present. 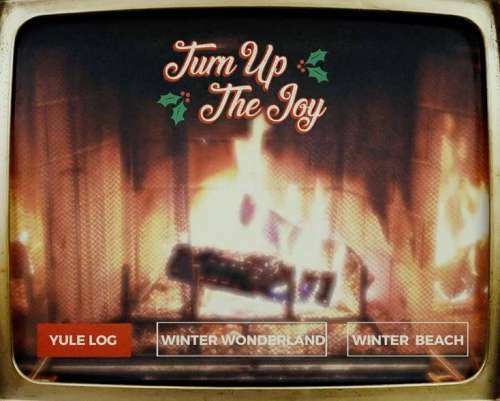 Available at TurnUpTheJoy.com, users can choose from one of three moods they want to set with a “live broadcast” of a Yule Log, which features a roaring fire framed by a picturesque stone fireplace; Winter Wonderland, an inviting home at night with twinkling lights, falling snow and wintery trees; or Winter Beach, a tropical paradise with aquamarine waves lapping on a white sand beach that will add some warmth into the most frigid climes. Once selected, users are then able to synch it up to their music streaming service and if preferred can then stream the audio and video to their TV to create the immersive holiday atmosphere of their choice. It can also be watched at your desk as you count down the days to Christmas. Soundtracking the yuletide backdrops is an expansive and eclectic playlist that is sure to please even the most discerning crowds with its wide range of artists that spans genres and eras. Simply titled Christmas Music, the playlist features some of the biggest songs and artists in the holiday music canon and pairs timeless classics with modern hits ranging from Bing Crosby to Gwen Stefani. There really is something for everyone and together with the unique festive scenes it’s guaranteed to help you Turn Up The Joy this holiday season.